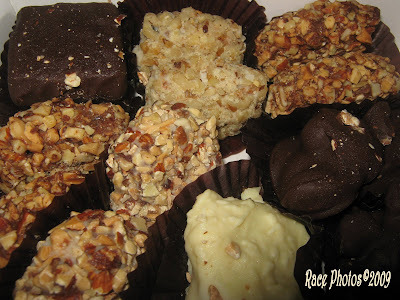 This is the See's Famous Old Time Candies which was brought to us by my niece Heidi and her hubby Lister, it's actually a pasalubong from one of Lister's Aunt in US. They were hoping to hand it personally to Josh but when they arrived he was asleep already. Gave it to him in the morning and because he's also a chocolate love like me he love it! Truth is we all liked it :-) though some are really very sweet! I like choco with a slight bitter taste, not too sweet but very chocolatey! This one by the way has lots of nuts in it! This entry is very early as we'll be going to Pansol later around 4am. That's a lot of chocolates...looks so tasty. I'm not even sure I can take the bite size, yeah but I would try it. I like those chocolate-covered pieces! Yummy! Wow! Sarap nyan! love the caramel filling! hehehe and I'm sure josh would love it!